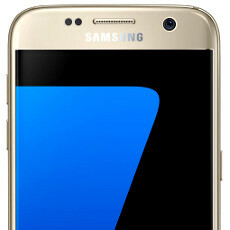 Whoever said that Samsung is lifting a page off Apple's book by releasing radical redesigns every other year now will have to think again when looking at the Galaxy S7 and S7 edge. First off, we don't know yet if Samsung will move to a completely new chassis next year, and second - the phones are actually set apart from the S6 and S6 edge much more than the Apple iPhone 6s is different from the iPhone 6. Samsung has wisely concluded that having the S6 edge with the same screen size as the S6, and the S6 edge+ with the same diagonal as the Note 5 diluted its high-end portfolio to high heavens last year. That is why it is now enlarging the S7 edge screen to the trendy 5.5" size, and we'd wager to guess there won't be an S7 edge+ released together with the eventual Note 6, either. The S7 edge sports a stellar screen-to-body ratio, too, making it one of the most compact 5.5-inchers out there, and both phones come with tapered rears for a more comfortable grip, and cameras that are way more flush with the back than what we have on the S6. When it comes to color versions, the US will get Galaxy S7 versions in Black Onyx and Gold Platinum, while the Galaxy S7 edge will color your day with three hues - the same Black Onyx and Gold Platinum, but also a Silver Titanium version added for a good measure. Check out all the official images of the S7 and S7 edge that Samsung has released so far, and tell us which hue do you fancy the most? that would be my next phone too. if you call switching module innovating then sure. Honestly. but i am, happy Lg is acutally taking risks now. a lot of people has been saying there for the last couple of years and lg really hasn't took off. it isn't really there fault because they try to at least market to the best of their capabilities but he problem is that they are over shadowed by samsung and that isn't going to happen anytime soon. i just checked german Samsung website and it is available in white color ! no silver !!!! Holding out on White. Those South Korean w***es!! I guess either Black or Silver for me.